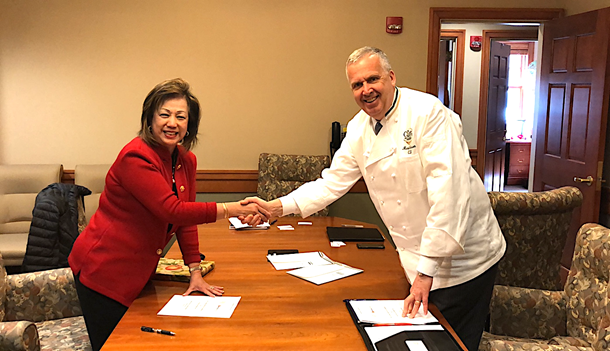 HYDE PARK, NY –In recent weeks, California Center President/CEO Margaret Wong and Director of Food and Agriculture Programs, Lei E met with Culinary Institute of America (CIOA) Provost, Mark Erickson to sign a strategic partnership for collaboration and development of programs in China at the CIOA headquarters in Hyde Park, NY. The group along with CIOA’s Dean of the School of Business and Management Studies, Dr. Annette Graham, also toured their impressive New York campus site. The MOU signals plans for the California Center to assist CIOA in establishing training, education, and innovation centers and eventually campuses in China to extend CIOA’s mission of widely providing the world’s best culinary education and leadership to industries, professionals, and consumers. The California Center will work together with CIOA to collaborate on the vision of providing leadership in China to support advancement around key culinary/food issues, trends, and imperatives in the ever-changing food world by focusing on professional excellence and innovation, health and wellness, world cuisine and cultures, sustainability and food ethics. “We are excited to assist the leading culinary school in the world to establish its footprint in China,” said Margaret Wong, President/CEO of California Center. “We look forward to getting to work and plan to start right away by creating an immediate presence for CIOA in Shanghai,” added Wong. Only one college, the Culinary Institute of America, has advanced the food professions and the American diet for over 65 years. And the CIOA vigorously carries forward this legacy of leadership in its education programs, research, and service — and through the global impact of its 49,000-plus alumni!